The three Mattel Barbie clothes outfits shown below, are rare and hard to find in any condition, each were featured only in the first Barbie doll pink 1959 booklet and the original vintage clothing was only sold in 1959. Each of these outfits have now been reproduced. Apple print polished cotton sheath dress with back zipper, coat of black unlined faille with patch pockets and bow accents, headband hat of blue silk organza, black shiny clutch purse, white pearl on a chain necklace, pearl earrings, short white tricot gloves and black open-toe pumps. Blue pin dot, bubble dress of rayon taffeta with accent bows and back zipper, a veiled headband hat in blue tulle, white rabbit fur stole with white lining, long white tricot gloves, dark navy blue open-toe pumps, white pearl on a chain necklace, pearl earrings and gold velvet clutch lined in white satin. Red and white ribbed cotton bodice with a navy skirt with back zipper dress, matching coat with half red lining, gold buttons, white plastic belt, white plastic clutch purse, black open-toe pumps, white short tricot gloves, black rimmed eyeglasses with white eyeglass case, white plastic comb, white cotton unhemmed hankie, white pearl on chain necklace, red straw cord hat, and a tiny brass compact with inside mirror and teensy pink cotton puff. The rarest Barbie accessory is the prototype fish that was supposed to come in the first 967 Picnic set (1959), however, it was never produced. The second fish that was produced in the 967 Picnic Set, can be found and is also highly sought. The next rarest accessory would be the real brass compact in Roman Holiday, very highly sought. The 968 Roman Holiday 1959 compact was supposedly made of brass and zinc, thus it should stick to a magnet, the reproduction Roman Holiday compact is made of painted gold plastic and won't stick to a magnet, but someone has written to say their original compact did not stick, so use your own judgment. For those of us not able to obtain those rare 1959 clothing outfits, your in luck, Mattel has reproduced the outfits shown above on left; 35th anniversary reproduction Barbie doll with outfits; Easter Parade and Roman Holiday. 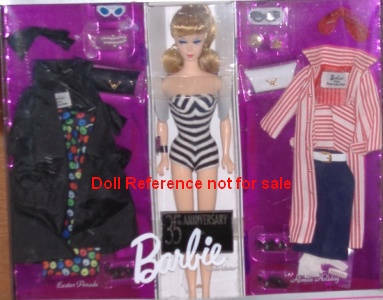 Shown on right; 964 Gay Parisienne 1998 outfit reproduced on a hard plastic dressed Barbie doll, also on a porcelain dressed Barbie doll in 2002. The Roman Holiday outfit (not shown) was also reproduced as a dressed Barbie doll in 1994. Barbie pink silhouette box doll - these dressed Barbie dolls were only given to dealers to use as display dolls in the stores from 1959 to 1960. The earliest boxes are marked TM just like early Barbie clothing, then they were marked R. These are the rarest of the Barbie boxed dolls, outfits will be from 1959-1960 as are the dolls. As you can see the dressed boxed dolls box, has pale blue stripes on the graphics, the box ends also state it's a dressed doll. Otherwise it's pretty much the same as the swimsuit clad dolls. We don't have the box cover for Skipper, however, you can see there was also a clear plastic cover, with a label identifying the named outfit, after the cardboard box top was removed. 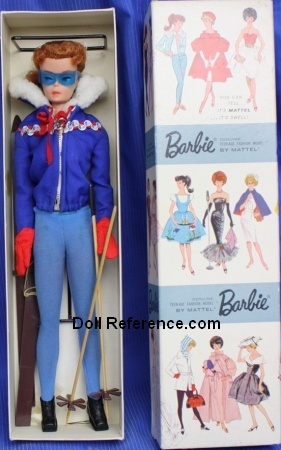 There were many outfits sold as boxed dressed dolls around 1963.